The antibody was isolated by affinity chromatography using antigen coupled to agarose beads. Our Abpromise guarantee covers the use of ab150116 in the following tested applications. Flow Cyt 1/2000 - 1/4000. ab178000 - Mouse monoclonal IgG1 (Alexa Fluor® 594), is suitable for use as an isotype control to complement this secondary antibody. ICC/IF image of ab7291 stained HeLa cells. The cells were 100% methanol fixed (5 min), permeabilized with 0.1% Triton X-100 for 5 minutes and then incubated in 1% BSA / 10% normal goat serum / 0.3M glycine in 0.1% PBS-Tween for 1h to block non-specific protein-protein interactions. The cells were then incubated with the antibody (ab7291, 1µg/ml) overnight at +4°C. The secondary antibody (orange) was ab150116 Alexa Fluor® 594 goat anti-mouse IgG (H+L) used at 2µg/ml for 1h. DAPI was used to stain the cell nuclei (blue) at a concentration of 1.43µM. The negative control (inset) is a secondary-only assay to demonstrate low non-specific binding of the secondary antibody. Overlay histogram showing Jurkat cells stained with ab8090 (red line). The cells were fixed with 4% paraformaldehyde (10 min) and then permeabilized with 0.1% PBS-Tween for 20 min. The cells were then incubated in 1x PBS / 10% normal goat serum / 0.3M glycine to block non-specific protein-protein interactions followed by the antibody (ab8090, 0.01μg/1x106 cells) for 30 min at 22°C. The secondary antibody Goat anti-mouse IgG H&L (Alexa Fluor® 594) (ab150116) was used at 1/4000 dilution for 30 min at 22°C. Isotype control antibody (black line) was mouse IgG2a [ICIGG2A] (ab91361, 0.01μg/1x106 cells) used under the same conditions. Unlabelled sample (blue line) was also used as a control. Acquisition of >5,000 events were collected using a 561nm laser and 610/20 bandpass filter. Cross-reactivity of the polyclonal secondary antibody ab182017 was tested using a sandwich ELISA approach. The wells were coated with the indicated IgG standards at 1 µg/ml (50µl/well) and incubated overnight at 4°C, followed by a 5% BSA blocking step for 2h at RT. ab182017 was then added starting at 1 µg/ml and gradually diluted 1/4 (50 µl/well), followed by incubation for 2h. For the detection Donkey anti-Goat IgG H&L (HRP) (ab6885) was used at 1/10,000 dilution (50 µl/well), followed by incubation for 1h at RT. 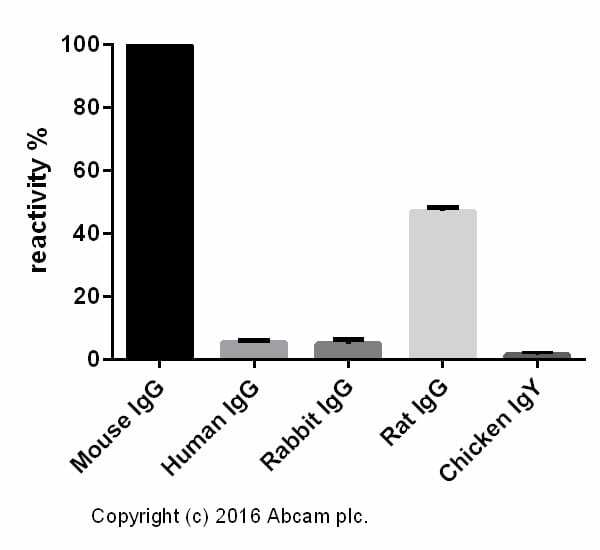 Fot the batch tested, ab182017 showed a cross-reactivity below 2% towards Chicken IgY, 6% towards Human IgG, 7% towards Rabbit IgG and 47% towards Rat IgG. This data was developed using the unconjugated antibody (ab182017). 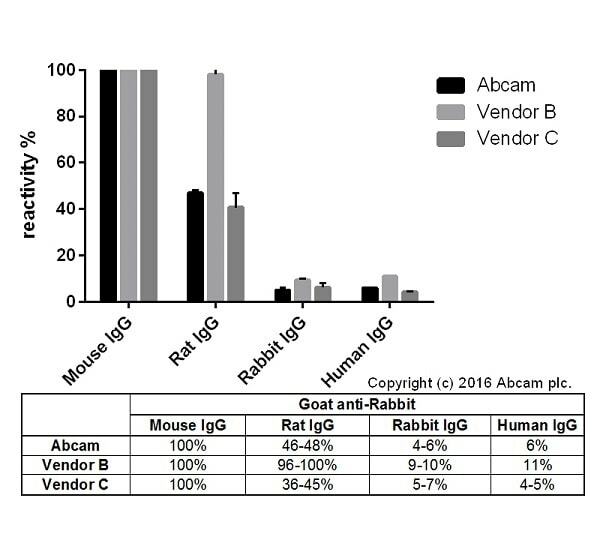 Cross-reactivity of Goat anti-Mouse IgG H&L (ab182017) and Goat anti-Mouse IgG H&L obtained from two different vendors was tested using a sandwich ELISA approach. The wells were coated with the indicated IgG standards (Rabbit, Human, Mouse and Rat) at 1 µg/ml (50µl/well) and incubated overnight at 4°C, followed by a 5% BSA blocking step for 2h at RT. Secondary antibodies were then added starting at 1 µg/ml and gradually diluted 1/4 (50 µl/well), followed by incubation for 2h. For the detection Donkey anti-Goat IgG H&L (HRP) (ab6885) was used at 1/10,000 dilution (50 µl/well), followed by incubation for 1h at RT. This data is from a representative dilution. Publishing research using ab150116? Please let us know so that we can cite the reference in this datasheet. Inner ear sensory epithelia were dissected from e16.5 mice and grown in culture media for 7 days. 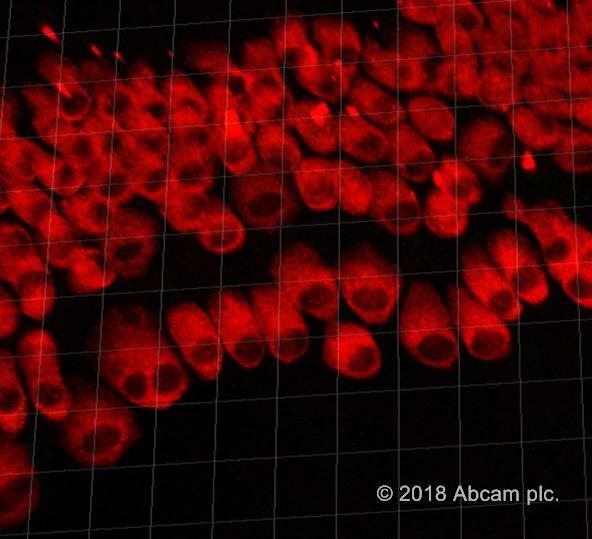 Then, tissues were fixed in PFA, permeabilized in trition, blocked in goat serum and incubated overnight in primary mouse anti myosin 7a antibody in 4 c. On the next morning, tissues were washed 3 times in PBS x1 and incubated for 2 hours (room temp) in Abcam's secondary goat anti mouse 594 antibody. 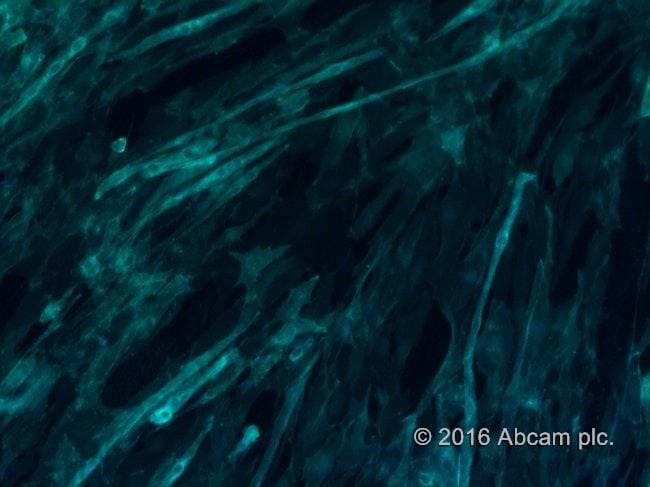 Tissues were imaged with Leica SP8 confocal microscope. Great antibody. It works perfectly at the concentration 1:1000 or 1:500. Picture shows myoblasts/myotubes stained with the dilution 1:1000 after Primary Antibody incubation. Green was used as false color here.